UNARCO Project Management can guide you through the planning and installation of your new or existing warehouse storage system. In the design and purchase stages of our pallet rack project, UNARCO can purchase decking or other components that are part of your system and transport as one shipment to help save you the headaches of tracking multiple loads. 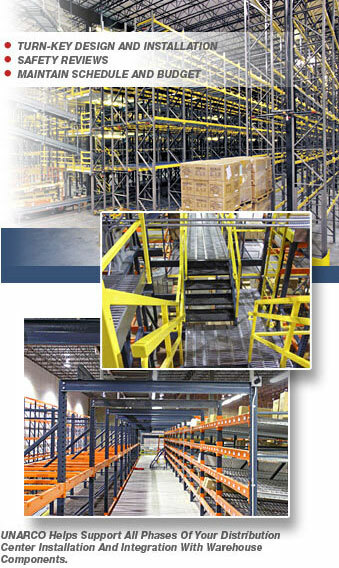 Installation of standard selective pallet rack or complex Pick Modules are standard practice at UNARCO. Our Project Management teams work with Installers all over the U.S. as well as Systems Integrators to install systems with conveyors, elaborate RFID and electronic systems for order picking in Carton Flow Rack, Pallet Flow Rack or Push Back Rack. Early project management resources include space planning and design that can get your pallet rack and storage project through the permitting stages with local building codes and city officials. Initial planning and attention to local building codes and special seismic criteria help save your worry in first project stages. UNARCO Project Management team will even acquire all necessary permits. As your warehouse storage project arrives, UNARCO Project Management staff can check in and inspect all products and help coordinate floor placement starting with the chalking of the floor for warehouse layout. UNARCO Project Management personnel can oversee the installation of pallet rack and work with contractors to negotiate and review work so you receive fair and valuable services. From simple material check-ins to complete on-site project management, UNARCO can help insure the safety of your project and make sure it comes in on schedule and on budget from delivery to the final inspection and Contractor sign-off. For photos of UNARCO warehouse storage projects and installations view UNARCO Photo Gallery.